I really enjoy knitting cables and surprisingly basic cable stitches are quite simple to knit. 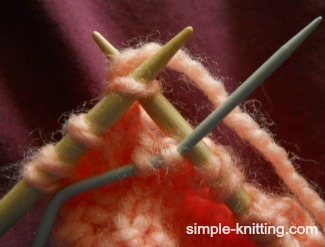 That's why I created this easy knitting lesson so you'll learn how to knit cables too. If you've been putting it off or afraid to try, grab some scrap yarn. Today is your day to learn! 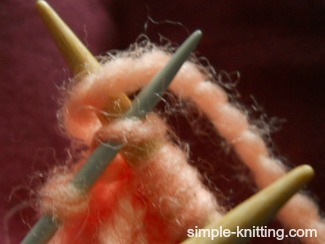 It's time to move forward with your knitting and cable knitting is a great place to start. First, let's get a better understanding about how cables are made. Cable knitting is done by crossing stitches over other stitches. 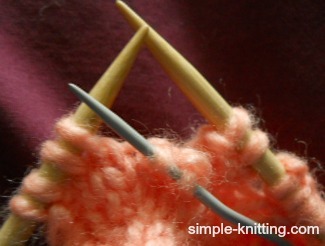 So all you'll be doing to create a cable stitch is knitting stitches out of sequence. 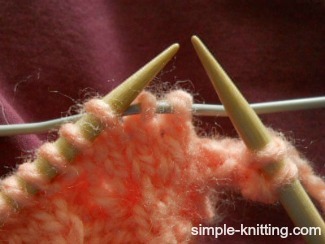 Think of it this way, look at the next four stitches on your knitting needle - there's stitch 1, 2, 3 and 4. Instead of knitting stitch 1 and 2 first you're going to knit stitch 3 and 4 first. Then you'll knit stitch 1 and 2. The only reason you use a cable needle is to get stitches 1 and 2 out of the way. The two pictures below show right slanting cables and left slanting cables. I've also included some explanations so you'll have a better understanding before you get started with the knitting cables lesson. When you hold the cable stitches in the back you will create cable stitches that slant to the right. C for cable, 4 is the number of stitches used in making the cable. B means the stitches will be held at the back of work. Or sometimes it will be R meaning a right slanting cable. The R also means that the stitches will be held at the back of work. When you hold the cable needle in the front you will make cable stitches that slant to the left. C is for cable, 4 is the number of stitches used in making the cable, F means it is to be held in the front. Sometimes it will be L meaning a left slanting cable that is held in the front. Adding cable stitches to your pattern causes the fabric to pull in just like ribbing does so make sure to add extra stitches. And make sure to knit a gauge swatch too. 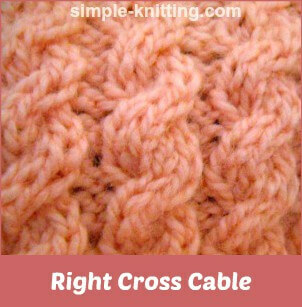 Knitting cables can be worked with a cable needle or there is a technique for knitting cables without a cable needle and that's really cool. Cables are not usually made on every row. Usually there are a few rows of plain knitting before you work another turning row. For instance a 4-stitch cable will have 4 plain rows of knitting before the cable row, a 6-stitch cable will have 6 rows of plain knitting before the cable row and so on. You can even add more rows in between. 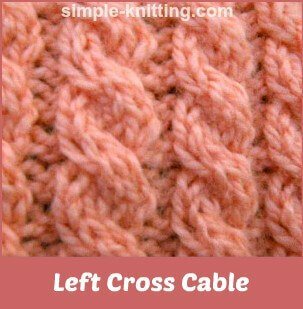 Cable stitches are usually knit on a stockinette stitch background so that the cable will stand out more. There are always exceptions of course but this is the standard basic method. Get your yarn and needles ready and let's start knitting cables. Don't forget the cable needle too. Oh and you may find that a bamboo cable needle or DPN works better. The stitches won't slip off. Even better? A U cable holder holds the stitches nicely. When you're knitting cables you usually need to knit a few preparatory rows. Image 1: Place cable needle at the back of your knitting. Image 2: Knit 2 stitches from left needle. Image 3: Then knit the stitches from the cable needle. These 4 rows create the 4 stitch cable slanting to the right. Image 1: Place cable needle in front of knitting. Image 3: Then knit stitches from cable needle. 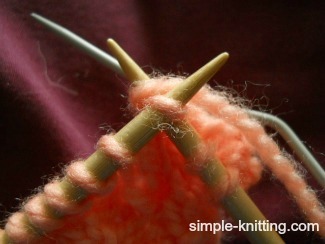 You can make the cables longer if you want too, by knitting more plain rows in between turning rows. For something different try making a cable row on the 4th row and then on the 6th or 8th row. 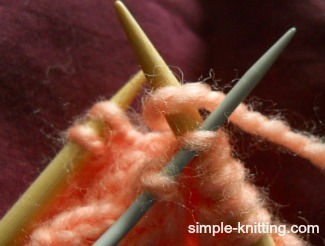 There are many ways to create your own style so play around and have fun knitting cables. Are there holes on the sides of your cables? There were with mine too. Loosen up the yarn a bit. All it means is that you are knitting the cable stitches too tightly. And the more you try to tighten up the hole the bigger it will get. You see when you're knitting cables the yarn gets really stretched and because it's being stretched it actually needs more yarn. So again just loosen up your tension and the holes will go away.